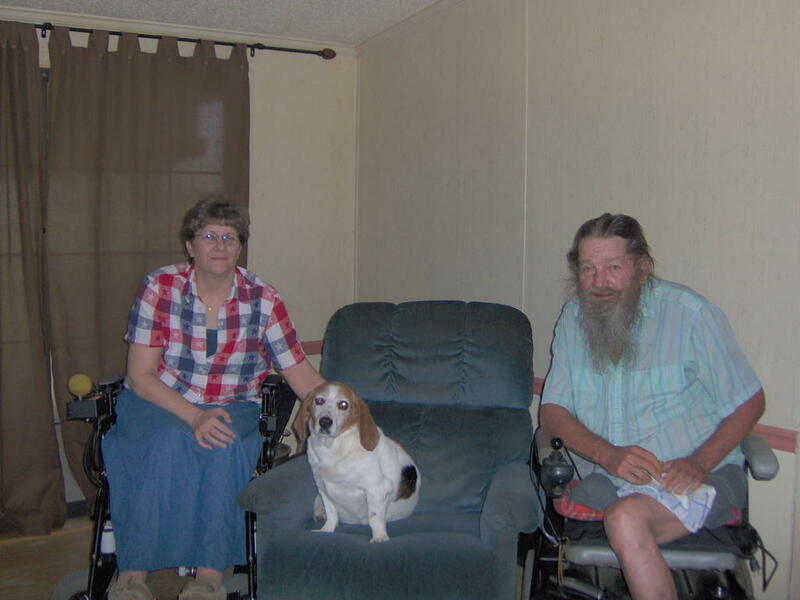 Officially 100 degrees today, 103 on my front porch, with a heat index of around 110 — and I made a decision a couple years ago not to run air conditioning here at the farm. Folks seem shocked when they learn that, but hey! folks around here didn’t even have electricity to run fans until ’49, so I consider myself kind of fortunate to have that! Get up early to do housework, what little is actually being done on these hot days. Have a stack of quiet projects to do in the afternoon — scrapbook materials, books to read, magazines to enjoy, music to play, movies to watch. Run lots of fans. Sit in the middle of them. Soak in a cool tub with a good book. If I’m not reading at night, or using the webcam talking with a friend, I don’t run many lights. Cook on the grill a couple of times a week. Shower using either Tom’s or Doctor Bonner’s mint soaps — the mint tingles on the skin and leaves you feeling “cool” for a long time after you get out of the tub. Iced tea is an absolute “must” in the South — sun tea to avoid adding cooking heat to the kitchen. I have some shorts and tops I wouldn’t be caught dead wearing in public, but they sure help me stay cooler and more comfortable at home. I try not to run any sort of errands during the heat of the day. The store’s air conditioning may feel good, but it’s too unpleasant adjusting to the extra heat of my car and back to the house. If I can’t go early in the day, I wait until late when the sun isn’t beating directly down on my head. A cool shower immediately before bed — no drying off! just lying in bed with the fan blowing on wet skin. Usually I fall asleep before I dry off. Oh — and God bless my dear neighbors who’ve given me an open invite to come jump in their pool any time! 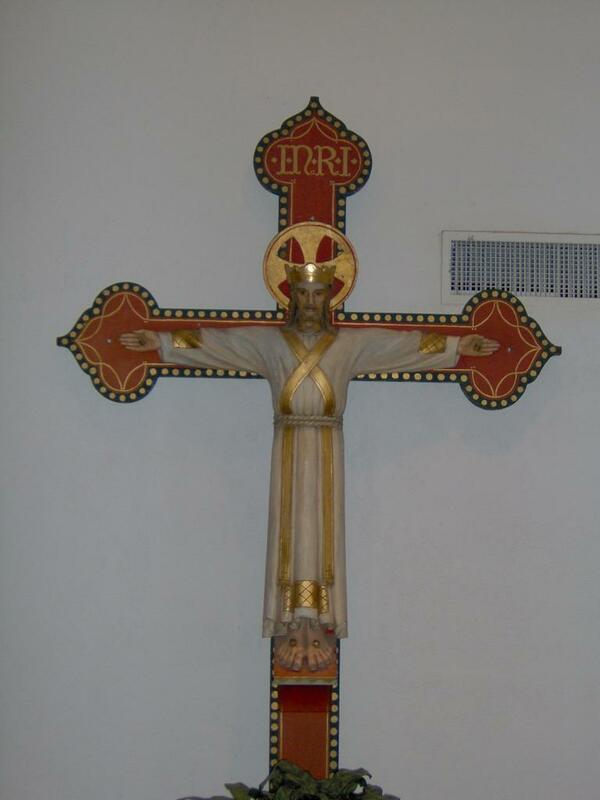 The artwork in the Abbey is beautiful. I’m sorry the photos of the interior of the church didn’t turn out, and I am even more sorry that I didn’t take more photos! 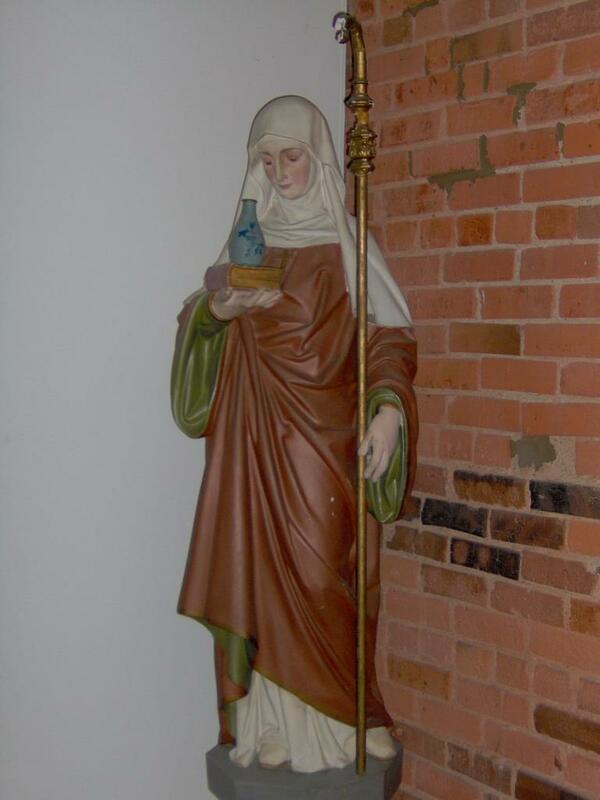 The most beautiful sculptures are not in the basilica itself, but in the sacristy and in the Abbey; many of which were created and donated to the Abbey by an oblate (a lay affiliate of the order). 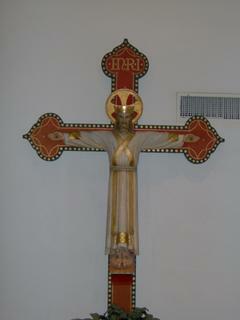 The first piece we saw was this crucifix, which hangs in the sacristy. The second photo is of a statue of the Abbey’s secondary patroness, St. Walburga, Patron Saint of Hospitality. Here is a photo from the narthex of the church. The first photo is of Kevin’s daughter Alexis leaning backward into the baptistmal font. Tradition maintains that this large granite stone was formerly used as an auction block for slaves. The inscription states that now the stone is used to purchase men from slavery to sin: “Upon this rock, men once were sold into slavery. Now upon this rock, through the waters of Baptism, men become free children of God.”. On the wall behind the baptismal font is a copy of the 1998 proclamation signed by John Paul II (The Great!) 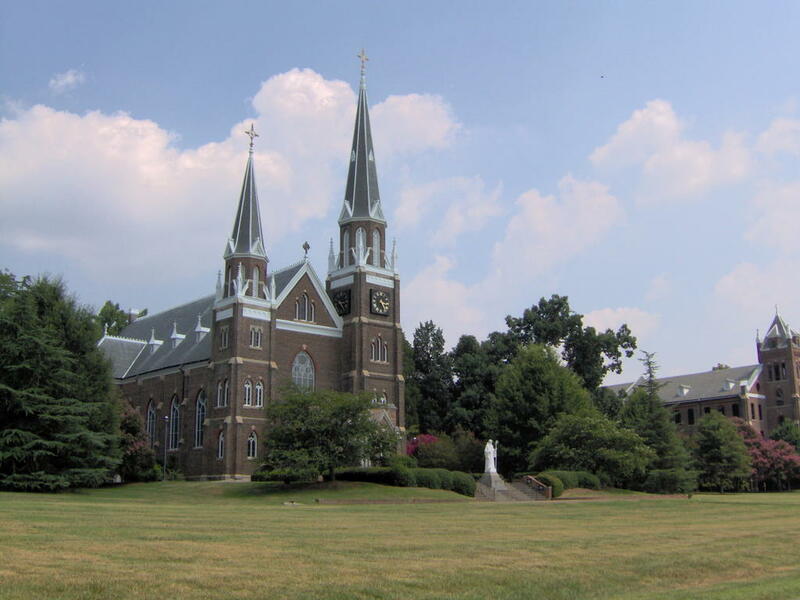 designating Belmont as a basilica. I’m going to try to post some photos that I took at Belmont on Saturday. I’m very disappointed that my photos from inside the basilica — of the beautiful Mary, Help of Christians, and the wonderful organ pipes — didn’t turn out well. I’m a slow independent learner of technology, and I’ve had this camera less than a month! First, a photo of the Abbey itself, where the monks and priests reside; the first floor is “public” area with guest rooms and offices and the Abbey refectory (dining room) and the monks and priests live on the second and third floors. Yes, it is a very l-o-n-g building! Y’all notice on my list of web sites I visit daily a little item called Catholic Online? Well, don’t be misled: I actually visit that post at least three times a day, and usually more often. I’ve been registered and participating since February, 2001, and it’s been one of the most influential websites I’ve ever encountered. Today a group of COLleagues from the Charlotte area met at Belmont Abbey for Mass and Mid-Day prayer at the basilica, then remained for lunch and fellowship. 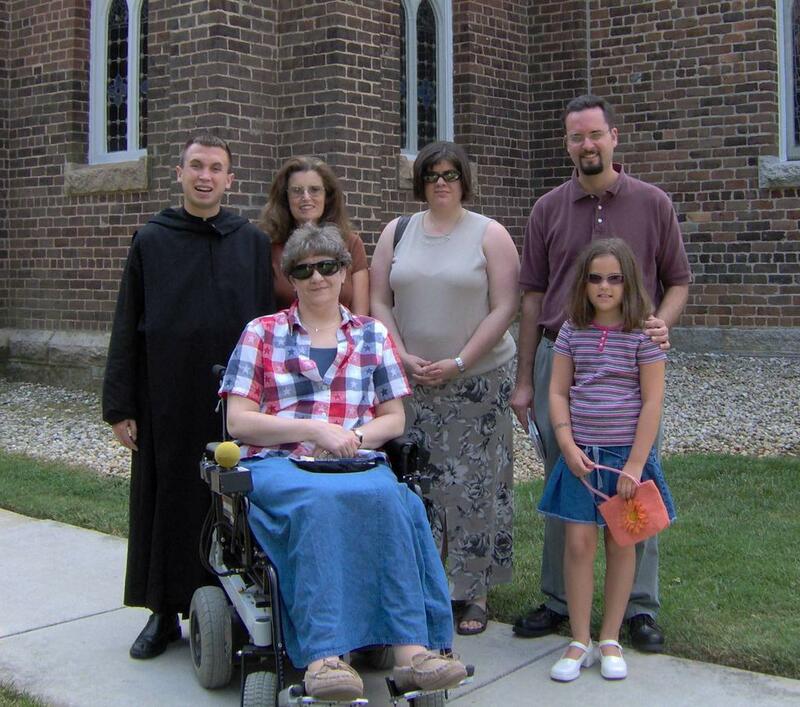 Several of us were able to stay longer for a tour of the abbey. 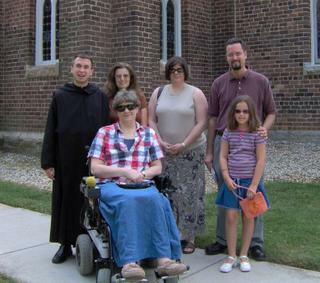 From left to right, in front, are Linda and Alexis, and in back, Brother Michael (Guest Master for the Abbey), Frances, Kat and Kevin. I’m behind the camera, where I intend to stay for a while! It was a wonderful day, spiritually enriching from the Mass and the Mid-day prayers, but you’ve got to appreciate what a joy it was to put faces and voices with people I’ve been in contact with in the forum for — Frances and I first “met” more than three years ago, before she moved to NC. This is definitely something I’m going to encourage other COLleagues to do in their own regions. Who knows? Maybe we’ll have a larger get-together before long, and then a national gathering…? Hi, y’all! I’m spending a couple of days with a friend from Catholic Online — Linda and her husband “Hutch” (pictured with Sparky). Saturday we head over to Belmont Abbey for a Catholic Online gathering. Keep us all in your prayers, okay? Some of my friends are going to have a fit, my recommending a Protestant minister’s web site — but if you don’t know who Mark Lowry is, you’re in for a treat. Mark is the amazingly talented (and hyperactive) musicican and comedian who wrote the hauntingly beautiful “Mary, Did You Know?” which is on the Favorites List of every single Catholic I know. He’s one of God’s special gifts to us.